When you think of a whistle, you probably don't think of a loud warplane engine that screams it's arrival from a mile away. But, that's exactly the type of plane the nickname "Whistle of Death" refers to. 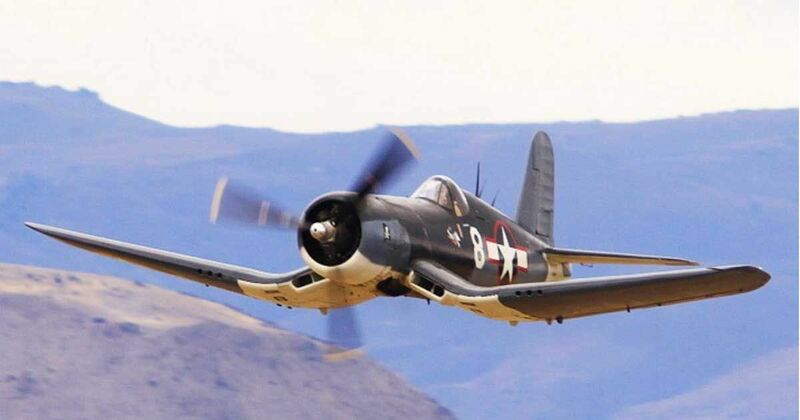 The F4U Corsair, a plane that looks a bit like a hodgepodge of random plane parts, was actually one of the most effective fighter planes during the second World War, according to The Aviation History Online Museum. The nickname "Whistle of Death" refers to the sound the engine makes when it goes into a dive. The U.S. Navy Bureau of Aeronautics regularly issued proposals for aircraft that was seemingly impossible to create, especially during the 1940s when technology was not nearly as advanced as it is today, and this plane was no different, according to The Aviation History Online Museum. War Bird Alley reports that development of the plane began in 1938. The Navy wanted a single-seat carrier fighter. The large propeller required to pull the plane (which carried the largest plane engine of the time period), forced the designers to adjust the landing gear and the wings, which is why the plane has such a distinctive design. The plane weighs almost 9,000 pounds empty, with a maximum weight of 14,000 pounds. Speeds topped out at 420 mph with a cruising speed of 185 mph. The original model of the plane featured two Browning .50s and six machine guns mounted under the wings. Watch the video below to hear the telltale whistle that announced the arrival of a dangerous fighter plane zeroing in on their target.